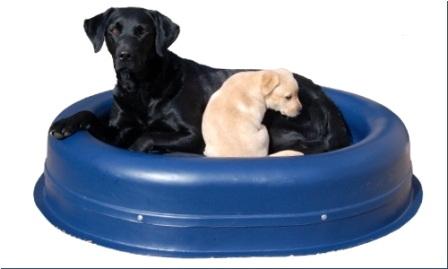 "Try a chewproof dog bed for the ultimate in comfort for your canine companion. It’s a fact of life when owning a dog that they do like to chew and shred their bedding – and other things. A chew resistant dog bed is the perfect solution for busy teeth." The major reason you will want a chewproof dog bed, aside from the fact that they have a habit of shredding the covering material, is to stop your dog from swallowing the filling in the bed. Many beds on the market have fiberfill, grain, recycled plastic, futon mattresses and even pine shavings in them. None of this is particularly good for a dog to ingest. Not only could your dog be very ill, but the vet bills would be phenomenal. We’re not just talking about what is inside the bed in terms of what your dog will eat. We’re also talking about the covering. While it may look nice and soft and warm and cuddly, it doesn’t matter how it looks, it matters how durable and chewproof it is. Dog beds are really made to appeal to people, just like dog food is created in shapes and flavors to appeal to humans to buy it for their dog. However, the ultimate user of a chewproof dog bed is the dog and you have to hope it really “is” chewproof, because you don’t want to leave home, only to return later and find the bed destroyed and most of the contents missing – soon to pass in their stool or lodge in their stomach or intestines. What material is used for the covering? You need durability and usually double layers. How is the material sewn or attached to the bed or frame? Is the material machine sewn or locked into the frame? Is the fabric easily detachable and washable? Can you hose the bed down and dry it easily? Are the zippers hidden or visible? Yes, dogs will eat zipper heads and rip them out of the fabric. Does the material have braided cording or some other fancy embellishment on it? This too may be eaten. Is the bed designed to be raised off the floor or flat? What material is the frame made of? If it’s wood or plastic, it will be chewed. Will the company replace a bed they state is a chewproof dog bed? We researched four chewproof dog beds, as advertised by the companies that sell them. We will provide a short review of each one of them and give you a link to the site’s we found for you. You will then be able to do your own research and make an informed decision about what will or won’t work for your dog. The reviews are listed in the order we have reviewed them. The first bed is the Kuranda Elevated Chewproof Crate Dog Bed: reasonably priced, it comes in a variety of materials, colors and frames and in six different sizes. You get free shipping. These are really nice looking beds, but we noted that a couple of them are made with co-extruded furniture grade poly resin, which they say is completely chewproof. From personal experience with poly resin, we have found that if there is a will to chew, there is a way for a dog to maim poly resin. In fact, a 95 pound Weimararner can do poly resin some serious damage. With poly resin legs and framing, he would go to town. 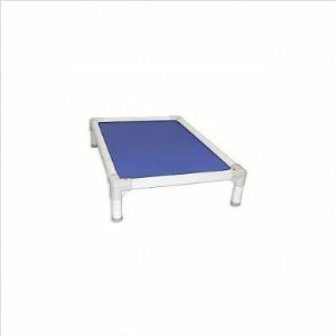 This same company also offers a Kuranda All Aluminum Elevated Chewproof Crate Dog Bed, made out of heavy duty aluminum throughout. This may be just the ticket for those inquiring teeth. It’s darn hard to get a good grip on the legs or frame of this model. 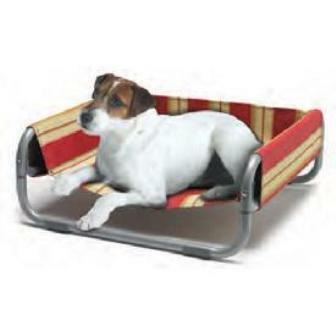 The second bed is the Lazy Pet Sof-Bed Indoor Outdoor Pet Bed. Very stylish and the frame is tubular metal. The material looks to be a heavy duck canvas. While it may deter a smaller dog from chewing, bigger dogs may just want to take a crack at the legs. Use with supervision. 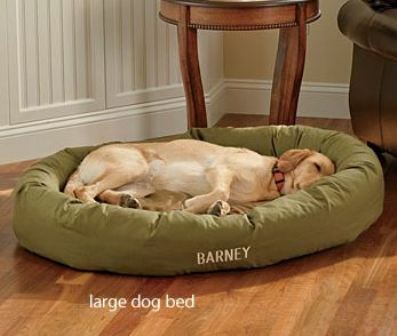 This dog bed is perfect for smaller dogs. Available for under $40 from Cherrybrook. The third bed we checked out was the Tough Tuffie, made in the UK and offering a money back guarantee. It’s cleverly made to keep the center material tucked into the plastic surround and while it may sustain chew mark attempts, it is definitely one tough looking dog bed. Be aware that if you add extra material, like a fleece liner, that your dog may chew it. The fourth bed is the ToughChew Bagel Dog Bed by Orvis of the USA and it is covered in two layers of 1,000-denier Cordura nylon, noted to be as tough as the dickens. This may slow your chewer down, but if you have a dog that is persistent, they may succeed in accessing the spun polyester center and the wraparound side pillows. This chewproof dog bed from Orvis offers a combination of comfort and strength. It is available for $169 to $279 from Orvis. My dog can eat tin cans, nylon tow strap webbing and ceramic tiles. Personally speaking, I would rather try a metal frame for him, but, each dog is different and you know them best to choose what they aren’t likely to chew. NOTE: It’s not just chewing that should be the criteria for choosing a dog bed. You need to also factor in vomiting, feces stains, incontinent older dogs and puppies. Using a bed will fiber fill or pine shavings means the liquids will seep through the top cover and affect the stuffing.